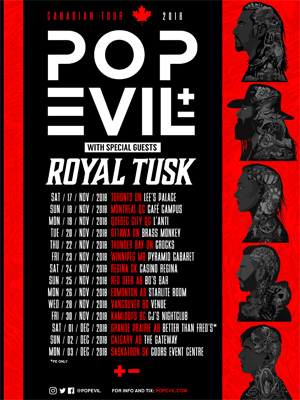 POP EVIL has announced a fresh batch of headline tour dates in Canada today in continued support of their latest self-titled release. Dates will kick off on November 17, 2018, in Toronto at Lee's Place hitting both coasts before wrapping up in Saskatoon at the Coors Event Centre on December 3, 2018. New label-mates ROYAL TUSK will support. "We are very excited to finally be back North of the border in my home country of Canada," says frontman Leigh Kakaty. POP EVIL is eager to perform for their fans in Canada. The only time the band has been there was at Rock The Park Festival in London, Ontario over the summer. "It always brings me full circle touring in the country I was born in. Plus, having the opportunity to play music off our new album brings a smile to my face. We can’t wait to play for our diehard Canadian fans!" The band debuted a stunning new music video for their track, “A Crime To Remember” just a few months ago. Directed by Columbia Tatone, who also directed the band’s last two videos, “Waking Lions” and “Colors Bleed”, it was the third music video installment we'd seen from the band’s most recent self-titled LP. The video beautifully defined the core message of the song, which is clear and present in the song’s triumphant background vocals: “Are we divided / Are we united?” - also a constant theme throughout the new LP. The video was in memory of late producer Kato Khandwala who was tragically killed in a motorcycle accident earlier this year in Los Angeles. Kato had produced countless rock albums including the most recent POP EVIL LP. In March of this year POP EVIL's single "Waking Lions" landed at #1 this on the Mediabase Active Rock airplay chart in the U.S. "Waking Lions" reached #1 after 20 weeks on the chart and is in the position of being one of the most spun songs at Rock Radio in 2018. "Waking Lions" is the band's fifth #1 single with the previous four being "Footsteps" (2015) "Torn To Pieces", (2014) "Deal With The Devil", (2013) and "Trenches" (2013). POP EVIL released their fifth LP, a self-titled album, on February 16, 2018, via Entertainment One (eOne). Produced by Kato Khandwala, Pop Evil captures Kakaty and his bandmates at their most inspiring.